Choose which Concept2 Performance Monitor you are using to see the connections steps. 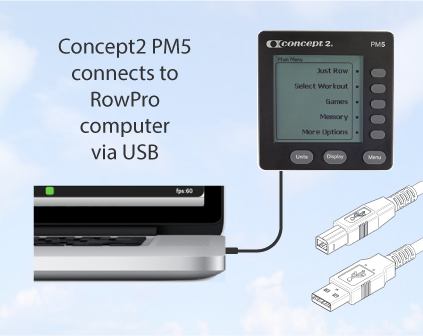 Your Concept2 PM5 connects to your RowPro computer with a standard USB cable like the ones used for printers. Do you have a spare USB cable from an old printer? If not, you could try the one from your current printer, and then get one from your local computer store or Concept2. The USB cable has an A (flat) connector and a B (square) connector. Connect the A end to a spare USB socket on your computer and the B end to the USB socket that's set into the base of the Concept2 PM5. Note the A connector should plug directly into a USB socket on your computer, i.e. it's best not to connect it via a USB hub if possible. After connecting, start RowPro and check the PM Connection Indicator on the bottom of the black frame of the RowPro PM twin. The indicator should be green with the word PM5 next to it. If the indicator is red, follow the troubleshooting steps below. Independent PM operation - Unplug your PM5 from your computer. Make sure the PM5 does not have flat batteries and works appropriately by itself when not connected to your computer. USB connection - Check the USB cable is correctly connected and intact. Ensure the USB connector is inserted in the PM5 the right way around so the beveled corners match on the plug and the socket. USB hubs - If your PM5 is connected to your computer via a USB hub, try connecting the PM5 directly into a USB port on your computer instead of via the hub. PM5 firmware version - Check which PM5 firmware version you have. Starting from the PM5 Main Menu, press Other options | Utilities | Product ID. Then check the Concept2 website at www.concept2.com for the latest PM5 firmware, and upgrade if there is a later version. PM5 reset - Insert a pen into the recess at the rear of the PM5 to reset it. Note this is a very important step that often solves PM5 connection issues. For more info please check the instructions in your PM5 user manual. RowPro version - On the RowPro main menu, click Help | About RowPro to confirm which version you have. Then check the Digital Rowing website at www.digitalrowing.com/software for the latest RowPro software, and upgrade if there is a later version. Windows - Disconnect your PM5 from your computer USB port and restart your computer. When Windows is fully ready, make sure you can hear system sounds (i.e. your volume is not on mute) and connect your PM to your computer via USB. Wait to hear the USB doh-dah sound. If you hear this sound, start RowPro and look for the green PM5 connection indicator on the bottom left of the RowPro PM twin frame. OSX - Disconnect your PM5 from your Mac USB port and restart your Mac. When the Mac is fully ready, open Finder, connect your PM5 to your Mac via USB, and confirm the the PM5 is listed in the Devices section of the sidebar at the left of Finder. If you see your PM5 listed there, start RowPro and look for the green PM5 connection indicator on the bottom left of the RowPro PM twin frame. Concept2 Utility - If you do not hear the USB doh-dah sound in Windows, or you do not see the PM5 listed in Finder | Devices in OSX, or the RowPro PM5 connection indicator is still red, close RowPro and open the Concept2 Utility - you can download this from www.concept2.com. If there is a red X over the PM5 icon in the Concept2 Utility, please email rowing@concept2.com for assistance. RowPro - If there is not a red X over the PM5 icon in the Concept2 Utility, and the RowPro PM twin connection indicator is still red, please email assist@digitalrowing.com. 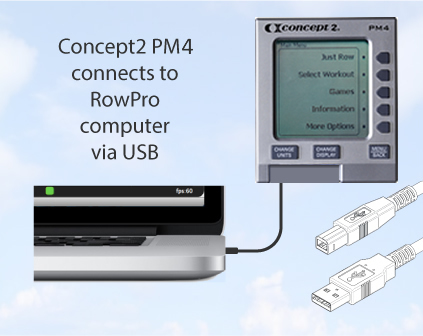 Your Concept2 PM4 connects to your RowPro computer with a standard USB cable like the ones used for printers. Do you have a spare USB cable from an old printer? If not, you could try the one from your current printer, and then get one from your local computer store or Concept2. The USB cable has an A (flat) connector and a B (square) connector. Connect the A end to a spare USB socket on your computer and the B end to the USB socket that's set into the base of the Concept2 PM4. Note the A connector should plug directly into a USB socket on your computer, i.e. it's best not to connect it via a USB hub if possible. After connecting, start RowPro and check the PM Connection Indicator on the bottom of the black frame of the RowPro PM twin. The indicator should be green with the word PM4 next to it. If the indicator is red, follow the troubleshooting steps below. Independent PM operation - Unplug your PM4 from your computer. Make sure the PM4 does not have flat batteries and works appropriately by itself when not connected to your computer. USB connection - Check the USB cable is correctly connected and intact. Ensure the USB connector is inserted in the PM4 the right way around so the beveled corners match on the plug and the socket. USB hubs - If your PM4 is connected to your computer via a USB hub, try connecting the PM4 directly into a USB port on your computer instead of via the hub. PM4 firmware version - Check which PM4 firmware version you have. Starting from the PM4 Main Menu, press Other options | Utilities | Product ID. Then check the Concept2 website at www.concept2.com for the latest PM4 firmware, and upgrade if there is a later version. PM4 reset - Insert a pen into the recess at the rear of the PM4 to reset it. Note this is a very important step that often solves PM4 connection issues. For more info please check the instructions in your PM4 user manual. Windows - Disconnect your PM4 from your computer USB port and restart your computer. When Windows is fully ready, make sure you can hear system sounds (i.e. your volume is not on mute) and connect your PM to your computer via USB. Wait to hear the USB doh-dah sound. If you hear this sound, start RowPro and look for the green PM4 connection indicator on the bottom left of the RowPro PM twin frame. OSX - Disconnect your PM4 from your Mac USB port and restart your Mac. When the Mac is fully ready, open Finder, connect your PM4 to your Mac via USB, and confirm the the PM4 is listed in the Devices section of the sidebar at the left of Finder. If you see your PM4 listed there, start RowPro and look for the green PM4 connection indicator on the bottom left of the RowPro PM twin frame. Concept2 Utility - If you do not hear the USB doh-dah sound in Windows, or you do not see the PM4 listed in Finder | Devices in OSX, or the RowPro PM4 connection indicator is still red, close RowPro and open the Concept2 Utility - you can download this from www.concept2.com. If there is a red X over the PM4 icon in the Concept2 Utility, please email rowing@concept2.com for assistance. RowPro - If there is not a red X over the PM4 icon in the Concept2 Utility, and the RowPro PM twin connection indicator is still red, please email assist@digitalrowing.com. 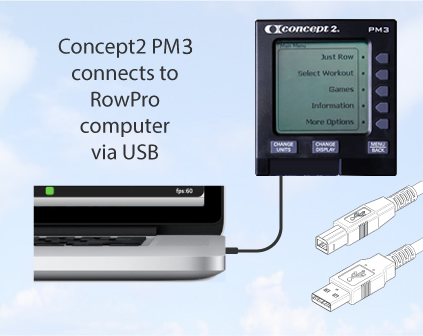 Your Concept2 PM3 connects to your RowPro computer with a standard USB cable like the ones used for printers. Do you have a spare USB cable from an old printer? If not, you could try the one from your current printer, and then get one from your local computer store or Concept2. The USB cable has an A (flat) connector and a B (square) connector. Connect the A end to a spare USB socket on your computer and the B end to the USB socket that's set into the base of the Concept2 PM3. Note the A connector should plug directly into a USB socket on your computer, i.e. it's best not to connect it via a USB hub if possible. After connecting, start RowPro and check the PM Connection Indicator on the bottom of the black frame of the RowPro PM twin. The indicator should be green with the word PM3 next to it. If the indicator is red, follow the troubleshooting steps below. Independent PM operation - Unplug your PM3 from your computer. Make sure the PM3 does not have flat batteries and works appropriately by itself when not connected to your computer. USB connection - Check the USB cable is correctly connected and intact. Ensure the USB connector is inserted in the PM3 the right way around so the beveled corners match on the plug and the socket. USB hubs - If your PM3 is connected to your computer via a USB hub, try connecting the PM3 directly into a USB port on your computer instead of via the hub. PM3 firmware version - Check which PM3 firmware version you have. Starting from the PM3 Main Menu, press Other options | Utilities | Product ID. Then check the Concept2 website at www.concept2.com for the latest PM3 firmware, and upgrade if there is a later version. PM3 reset - Insert a paper clip into the small hole at the rear of the PM3 to reset it. Note this is a very important step that often solves PM3 connection issues. For more info please check the instructions in your PM3 user manual. Windows - Disconnect your PM3 from your computer USB port and restart your computer. When Windows is fully ready, make sure you can hear system sounds (i.e. your volume is not on mute) and connect your PM to your computer via USB. Wait to hear the USB doh-dah sound. If you hear this sound, start RowPro and look for the green PM3 connection indicator on the bottom left of the RowPro PM twin frame. OSX - Disconnect your PM3 from your Mac USB port and restart your Mac. When the Mac is fully ready, open Finder, connect your PM3 to your Mac via USB, and confirm the the PM3 is listed in the Devices section of the sidebar at the left of Finder. If you see your PM3 listed there, start RowPro and look for the green PM3 connection indicator on the bottom left of the RowPro PM twin frame. Concept2 Utility - If you do not hear the USB doh-dah sound in Windows, or you do not see the PM3 listed in Finder | Devices in OSX, or the RowPro PM3 connection indicator is still red, close RowPro and open the Concept2 Utility - you can download this from www.concept2.com. If there is a red X over the PM3 icon in the Concept2 Utility, please email rowing@concept2.com for assistance. RowPro - If there is not a red X over the PM3 icon in the Concept2 Utility, and the RowPro PM twin connection indicator is still red, please email assist@digitalrowing.com. You can connect multiple PMs to a single RowPro computer for venue racing or crew rowing. The PMs can be any mix of PM5, PM4 or PM3. The number of PMs is set by the RowPro plan: Quad plans enable 4, Crew plans enable 8, Club plans and 20-day free trials enable 16. All PMs connect to the RowPro computer via USB cables and hubs. The most important step is the preparation. First, make sure all PMs have recent firmware. If you're in any doubt, upgrade all your PMs to the latest firmware from Concept2. Next do a 'pinhole reset' at the back of each PM to ensure it's ready. Then USB-connect each PM one at a time to the RowPro computer, start RowPro, and confirm it works. Assign #1, 2, 3 etc. to each erg. Connect the USB hubs and cables between the PMs and the RowPro computer. All USB hubs must be mains-powered. Tape down USB cables so they're not a trip-hazard. Start RowPro, open the Indoor Rower Layout utility, and follow the steps there. Independent PM operation - Unplug the USB cable at each PM one at a time. Make sure the PM does not have flat batteries and works appropriately by itself when not connected via USB. Reconnect the USB cable. USB connection - Check the USB cable is correctly connected and intact. Ensure the USB connector is inserted in the PM the right way around so the beveled corners match on the plug and the socket. USB hubs - Ensure every hub gets its power from a mains adaptor connected to a mains wall socket, and the power is turned on and working. Check the lights on the hub to confirm it's working. Replace any suspect USB hubs. PM firmware versions - Check which PM firmware version you have. Starting from the PM Main Menu, press Other options | Utilities | Product ID. Then check the Concept2 website at www.concept2.com for the latest PM firmware, and upgrade if there is a later version. PM reset - Insert a pen or paper clip into the recess at the rear of the PM to reset it. Note this is a very important step that often solves PM connection issues. For more info please check the instructions in your PM user manual. Windows - Disconnect all USB cables from all your USB hubs and restart your computer. When Windows is fully ready, make sure you can hear system sounds (i.e. your volume is not on mute) and connect one USB hub to your computer. Wait to hear the USB doh-dah sound. Once you hear this sound, slowly connect each USB hub and PM in turn, listening for the USB doh-dah sound each time, until they are all connected. Then start RowPro. OSX - Disconnect all USB cables from all your USB hubs and restart your Mac. When the Mac is fully ready, open Finder, connect one USB hub to your computer, and confirm the hub is listed in the Devices section of the sidebar at the left of Finder. Once you see your USB hub listed there, slowly connect each USB hub and PM in turn, confirming it appears in Finder each time, until they are all connected. Then start RowPro. Concept2 Utility - If you do not hear the USB doh-dah sound in Windows, or you do not see the PM listed in Finder | Devices in OSX, or the RowPro PM connection indicator is still red, close RowPro, disconnect all USB hubs from your computer, open the Concept2 Utility - you can download this from www.concept2.com, and then connect each PM via USB one at a time so there is only one PM connected at any point. If there is a red X over the PM icon in the Concept2 Utility, please email rowing@concept2.com for assistance. RowPro - If there is not a red X over the PM icon in the Concept2 Utility, and the RowPro PM twin connection indicator is still red, please email assist@digitalrowing.com.